Four in a row, the bad way. Every year every team goes through a stretch where they drop a few in a row. Most teams do it several times. 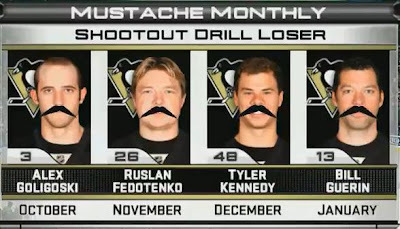 It's no different for the Pens. Last time it was from injuries; this time its for real. Personally I feel the hockey gods are putting the Pens back in their place for beating Ottawa down like Debo a week an a half ago. Certainly this is not the way to start 2010 off, though if you remember correctly we started 2009 off dropping three in a row to spawn a five game losing streak. That was also preceded by a 5-8-1 December. This year, 7-5-1...an improvement no doubt. And as you read in the pregame quote Bylsma is pleased with his teams effort in the first half of the season. But you know just as well as I do the players don't feel the same, they're hard on themselves. The 90's are now two decades ago, Feds. One minute into the game Martin St. Louis gets rewarded for some quality play. He dumps, chases, pursues, gets in front of the net, and lifts it over the blocker of Fleury, [0-1]. Unfortunately in the past 17 games the Pens have allowed the first goal in 13 of them. Though we have had a few posts titled "Comeback City," so to us that doesn't mean a whole lot. Tampa Bay has been hot as of late with a 4-1-1 record (five of them had been played in St. Pete Times forum) and they came out with a purpose. Or maybe it was just the Pens playing that bad, either way. Pens kill the penalty, nicely. Crosby, Malkin, or Staal’s lines didn’t get any chances in the first 10 minutes. Zero Scoring chances. Mainly for getting stuck in their own zone…again. A problem they've had, well, for the last 4 games. Finally nearing the end of the period Guerin cleans up Staal and Kunitz's garbage to tie the game, [1-1]. First goal in over 115 minutes. Exciting and depressing. After that the Pens actually started playing some aggressive hockey, though two minutes of aggressive hockey doesn't win you games. Lecavalier takes a high sticking penalty with 2:03 left in the period. Despite not having Gonch out there the Pens looked great and had some quality chances on the power play. 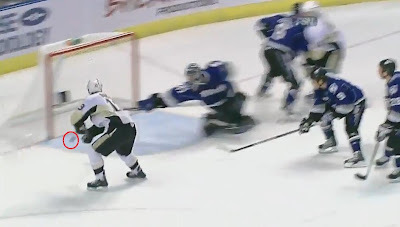 Malkin nearly sunk a rebound off a Crosby shot but hit the outside of the post. Wasn't the first time he hit the post in the game. Second pp line comes out, nothing. When’s the last time they scored on the pp? Have they even scored? After essentially squandering the better half of the period, the Pens finished strong, and on paper, won the battle. First 5 minutes were back and forth. Teams both played in the neutral zone. Neither team with any good chances. After that, for the next 4 mins we witnessed hockey at its best, up and down seesaw hockey. Long pass after long pass. Two on one after two on one. What I like to term, Phoenix Suns hockey. In the middle of this up-and-down sequence Fleury makes an unbelievable save..
Wonder why he's representing his country in Olympics? Ol' Bugsy Malone went to the box for holding Gogo's stick. Pens didn’t converge. We still 30th in the NHL? Gogo made a bad pass, turns it over in the neutral zone. 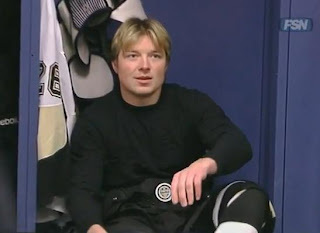 A common theme in the 09-10 Penguins drama. Right after that Smabe (pron. Smay-bee) heads to the box. Once again, nothing. The Pens had more then their share of chances. Bolts goalie Mike Smith (most generic hockey name to date) was missing his stick. Was like playing a 5 on 3 and the Pens only registered one shot. After that momentum shifted and the Lightning struck. With several quality sequences and a few missed opportunites, Konopka got position and found one on the doorstep after Stamkos fired a hard wrister to the net, [1-2]. Stamkos, remember that name. Watch him now while he's an 60+ point guy. Soon he'll be 80-100+. In an act of karma, the hockey gods gave the Bolts a powerplay to end the second (cf. end of first period). The odd thing is, I don’t get nervous when we go on the pk. I do on the pp. Should be the other way around. 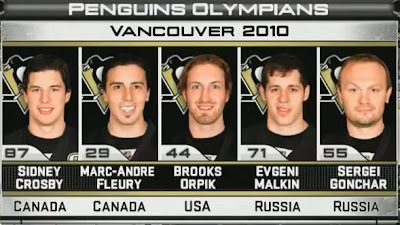 As before, the Pens did kill it. Bolts got 20 shots on Fleury before the period was over. Good save percentage, though it shouldn't happen. I asked in the beginning of the period via twitter who would score for the Pens in the third. A few responses came in. Gologoski, Staal, Kennedy. I didn't make any guesses, just wanted someone to score. Meh. Before the start of the third Potash interviewed Mike Yeo. As Steggie pointed out, "it sounded like someone died down there." I can't imagine how the locker room was. I'm guessing less than encouraging. Sesame Street line came out STRONG. A lot of times their energy is what gets the Pens going. You wonder why that line is always out there starting the game. Early on Cooke and Konopka got at each other. Cooke trying to get the energy level up. Both to the box. During the 4 on 4 Lecavlier gets a penalty shot. Out of his 9 chances he had 4 goals. Make that 4 goals in 10 attempts. 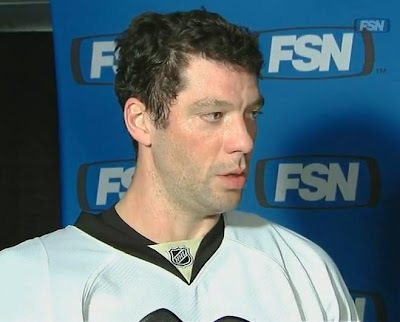 Just when you thought momentum was going to shift from Fleury making that save, Steve Downie gets a rebound and finds Fleury out of position, [1-3]. Not much after this. Pens had a couple more chances. Malkin hit the post again. Sid lost his helmet, then his temper. Wanted a piece of Veilleux. Anyone seen Talbot...and not in a commercial? Mike Rupp needs more than just 8 minutes of ice time. Geno had a bad game again. Looks flat. Saving himself for the Olympics? We missed Gonch, not on the powerplay, but in our own zone. TWEET OF THE NIGHT will return, it will. Cats are up next. How about another 3-2 win, eh?